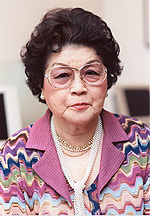 Dr. Mitsuko Saito, the late founder of Communicators and former ICU professor emeritus, defined communication as being “a warm-hearted exchange between people,” and believed that interpreters needed to be communication specialists in addition to being language specialists. In keeping with her principles, we are committed to implementing education and training from the standpoint of communication studies so that we can provide our clients with only interpreters (communication specialists) that have the skills and attitude to facilitate a sincere exchange between the speaker and listener. Our mission is to support our clients and to contribute to society in various cross-cultural communication settings. Communicators is a group centered on interpreters produced from the “Saturday School” established by Professor Saito, who was deeply committed to training interpreters. We have implemented education and training from the standpoint of communication studies, and continuously emphasized the importance of non-verbal communication elements in addition to linguistic ability. Obtained a doctoral degree in speech communication at Northwestern University. Professor emeritus at the International Christian University. Became the president of Communicators in 1994. Passed away in February, 2004. Served as a member of the executive board of the Japan Society for Future Research, member of the executive and editorial board of the International Institute of General Semantics (U.S.), member of the executive board for the Society for Intercultural Education, Training, and Research (U.S.), member on the Board of Certification for Sign-language Interpreters and member on the Textbook Authorization and Research Council, etc. Published various books and translated works, including long-sellers such as “Hanashi-kotoba no Kagaku Communication no Riron,” “Kiki-kata no Riron Zoku Hanashi-kotoba no Kagaku” (both published by Simul Press, Inc.), and “Hanashi-kotoba no Himitsu” (Soryusha Junior Sensho). After an active career as a pioneer simultaneous interpreter in Japan, she dedicated the rest of her days to training professional conference interpreters. The late founder of Communicators, Professor Mitsuko Saito, often drew a “Hoshu no Tama” with ink on white paper, noting how it was impossible to draw the exactly same thing twice, but being amazed at how training enabled her drawings to become increasingly powerful, with even the drawings she regarded as being unsuccessful to have a certain flair. The “Tama (ball)” represents a person in a state of no-mindedness; from this, power rushes forth, forming flames that ascend towards the heavens. Treasure what you originally possess (the ball), and grow by working hard and learning from your experiences (making the flames grow higher). Professor Saito said that she felt that respecting oneself led to the desire to respect and understand others.